There was a time when 17-inch widescreen laptops were considered downright huge, but thanks to lower LCD costs and Dell's launch of its 20-inch widescreen notebook, the XPS M2010, monstrous laptops are starting to take over my test area. The Acer Aspire 9805WKHi, with a 20-inch widescreen, weighs a shoulder-straining 17.1-pounds, so it isn't for everyone. 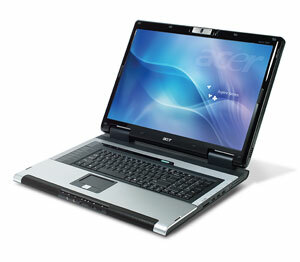 It's abundantly clear that Acer didn't put as much thought into the Aspire's design as Dell did into the XPS M2010. Apparently, the company just found the largest screen available—a gorgeous 20.1 inch CrystalBrite display—and slapped it onto a laptop base secured with some hinges. Unlike the M2010's LCD, which lets you adjust heights and positions, the Aspire gives you only one comfortable viewing position.